Sam is all alone and really, really wants his own family. Sam is a 12 year old, 69 pound male, who comes to us after his beloved owner passed away. Sam is very affectionate, in fact very velcro for reasons that are easy to understand. His person went away after 12 years of dedication and love. He doesn’t want to be left alone again. Unfortunately he had to spend several weeks in a kennel in Pennsylvania until his foster family could get to him. He is currently recovering from a very nasty ear infection. We are hopeful that it’s mostly cleared up (we’ll find out in a few days on his next vet visit). He wants me to tell you that he is housebroken, and doesn’t care to have accidents. He barks to let you know to let him out, or get the leash if needed. He plays nice with the other dogs in the foster house, though cats are a definite no. In fact a very small dog may not work either. While we’re on the subject, small children are rarely a good idea with senior dogs. His hearing is diminished greatly, though he hears high sounds. Oddly enough, he’s a good listener and cheaper than a therapist. Overall, Sam is a healthy 12 year old, and would love to find a special home and heart to share. Would you be interested in offering a lonely old, velcro dog a home? 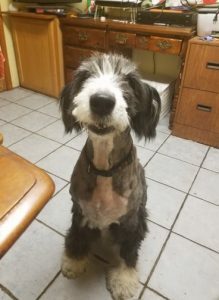 By the way, since Sam considered a “senior” dog, he is eligible for a special program from New England Old English Sheepdog Rescue – the Super Senior Sheepie Support Initiative. Check it out!